mens leather trench coat. Siddharth Global are leading manufacturer and exporter of mens and womens leather trench coats and wide range of other leather apparels , accessories and bags. 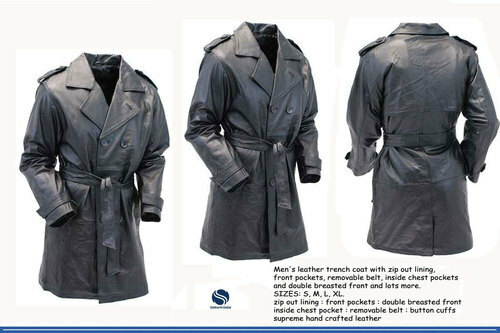 mens leather trench coat. Siddharth Global are leading manufacturer and exporter of mens and womens leather trench coats and wide range of other leather apparels ,accessories and bags. Siddharth Global are leading and trusted manufacturer and exporters of an alluring assortment of excellent quality tote bags, business totes, canvas bags, shopping bags, beach bags, organic cotton bags, leather bags , laptop bags, duffel bags, diaper bags, messenger bags, backpacks, sleeves, iPad bags, jute bags, purses, fashion bags, designer bags, evening bags, clutch bags, cosmetic bags, beaded bags, embroidered bags, travel bags, over night bags, day bags, wristlets, promotional bags , customized bags and a host of others. We export majorly in USA, UK, Scandinavia & Middle East. Our offered amazing array of bags is designed & developed by our professionals in accordance with the latest fashion trends & styles. Our fashion range includes bags embellished using semi-precious stones, hand beaded and embroidered and other stunning embellishments. The whole collection is a splendid & unique combination of fashion, form and function. The range is well suited for all outfits and occasions and all local and international locations. Our esteemed clients can avail the offered range of bags from us in various colors, shapes, patterns, designs and customized specifications. These bags are widely known for their beautiful patterns, neat stitching, fine finishing and water resistance (if required) properties. We have developed a sophisticated infrastructure facility to perform all business operations in a streamlined manner. Our modernized facility is well equipped with the advanced machines and latest technology to ensure the streamlined execution of all activities. Further, for handling all business processes smoothly, we have hired a team of experienced professionals. Under the valuable guidance of our Founding Owner ‘Satyapal Sharma’, we have been able to gain a reputed stature in this domain. His immense experience & knowledge of this industry have helped us in gaining an edge over our industry counterparts. We assure you of an enjoyable buying experience with us.